Remember those lyrics from the famous ABBA group in the late 1960’s got famous from their varieties of songs and everyone do love and now it is still hits in the modern Karaoke machines. We all knew and waited that his biggest fight ever is with Oscar De Lahoya a famous and good boxer too. And finally happened last 06 December 2008, 12:43pm and 07 December 2008, 1:00pm Manila Philippines Time. But before that, I was grateful very dear friends of mine were online and shared the live event with me online too thru Yahoo Messenger. For those who’ve been using Yahoo Messenger I’m sure you know what I mean. She’s from CA and I’m here in NY but still it works totally fine and clear too. As if I was just behind their couch while watching until the whole event of the night is over. I won’t give much detail anymore, for I know that thousands and millions of blogs, newspapers, radios and TV news talked about the main event in MGM Las Vegas. 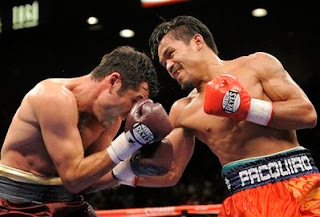 I could say that Pacman is a Boxer Legend; he makes the whole Filipino proud wherever they are in the world. He gave his shot to his fight and not only for himself but for giving a name to the whole world. Every single Filipino will be PROUD of the contribution he gave to our country. Mabuhay ka Manny “Pacman” Pacquiao! Yes, I watched the show, too sis. He is a legend, indeed. He is everybody's IDOL. sIS, CONGRATS U HAVE A nice lay out here.xmas na ang ambience, hehehe. Aduna kay usa pa nga blog na ba? Have yet to see it after this. Missed ya, sis. Thanks for the visit dear..